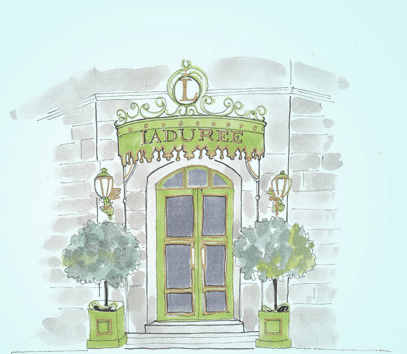 A pilgrimage to Ladurée, a temple of one of the world’s most famous sweets. If you’re over 50 and have ever traveled on a press trip with a group of vibrant, young journalists, you soon realize they have been everywhere and know everything, especially when it comes to where to shop and what to eat in Paris. When the “car talk” on a recent trip to the City of Light led to a discussion of the quintessential French pastry—the macaron—my colleagues were unequivocal that Ladurée was THE place. Although a stop wasn’t on our itinerary, an excursion and tasting to this historic patisserie seemed mandatory so off we went. The shop we visited (at 16 rue Royale) is the original location of what now has become an international dynasty. Although the history of these sweet treats remains hotly debated, many believe they were first created by Catherine de’ Medici’s Italian pastry chefs during the 16th century. But it was in France that the meringue-based confection achieved its prominence and began to spread across the world stage. At Ladurée, macarons, pastries and chocolates are displayed in glass and brass showcases like miniature works of art. Well-lit with crystal chandeliers and mirrors, the elegantly decorated shop adjoins an equally inviting Parisian-style tearoom, one of the first in the city. Because there was a time when women weren’t permitted inside Parisian cafés, they flocked to tearooms such as this as places to meet outside their homes. These days, macarons are sold all over Paris (including McDonald’s) but it’s reported that Ladurée alone sells more than 15,000 each day. Ladurée has six stores in Paris, one in Versailles, and multiple locations at the Charles de Gaulle Airport—as well as a growing list of outposts in other European cities, Asia, Africa, South Africa and Oceania. The brand has been expanded to include chocolates, bath and body products and other gifts and collectibles. Like high-couture designers, each year the patisserie introduces new desserts to its collection. Of course, when we returned home, our also-worldly twenty-something son told us he’s sampled the iconic pastries at Ladurée on the East Side of Manhattan many times. A second New York store opened in Soho this past February with a popular tearoom beside it. The New York delicacies are made in France and flown here, each one costing $2.70. If you really like them, the addiction will only prove slightly less expensive than booking a trip to Paris. The lines are generally shorter at the airport locations in Paris as opposed to the ones in the city. The half-life of a macaron is three days so if you plan on taking some home, pick them up towards the end of your trip. Do you have a favorite flavor macaron? Mine is vanilla. Beautiful! We even have a Parisian macaron shop in Delray Beach. Delray is getting more and more “stuff”—even since I visited you! Yes, the airport shops are hard to resist! We’ve been reading lots about macarons lately – they seem to be the new “it” sweet treat :-). Soooo good.